If you haven’t heard of Haley + Michaels, you should definitely check them out! They are the cutest country music couple and so sweet! 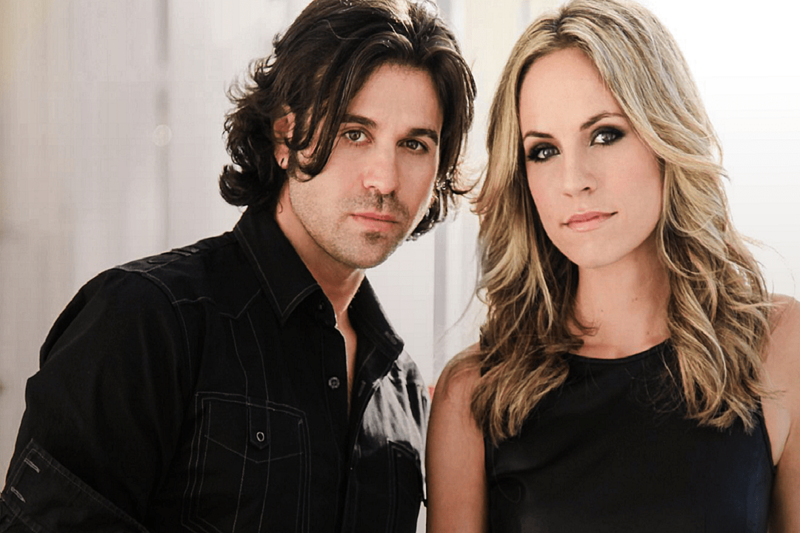 Our CC was able to interview the country music duo and get the inside story behind their new single “Me Too,” which was inspired by the #MeToo movement. Meet Haley + Michaels! HC: What are both of your real names? And how did they idea come to call yourselves Haley & Michaels? H + M: Our real names are Shannon Haley and Ryan Michaels. But now that we’re married, my name is legally Shannon Haley Michaels, but I professionally go by Shannon Haley. We originally had a lot of bad ideas for names, but eventually just wanted to keep it true to us so we went with our last names. When we started, I didn’t realize that down the road my name would encompass the entire duo name in it!! HC: Where and when did you meet? H + M: We met in Nashville at The Frothy Monkey in 2011. We found out that we grew up 3 miles apart from each other in California but never met! HC: When did you get married and how long were you together before you got married? H + M: We got married on May 9, 2015. We started dating in 2012, so about 2 years before we got engaged and then a year of engagement before we got married. HC: What is the best and worst part (if any) about singing together? H + M: The best part is definitely being able to have your favorite person there with you making music, and we have always felt such a connection between our voices and feeling that blend is still a thrill. The worst part is probably doing vocal warm ups in the same room because we have lots of warm ups and if you heard them happening at once, you’d understand why that is the worst part. HC: How do you find a balance between your work life and home life together? H + M: We both feel so fortunate to be so passionate about our career, so luckily we don’t have a problem with pouring ourselves into work, because it is something that we love and that we get to do together. In some ways our career is a lifestyle and blends in with personal life so much that it’s hard to separate. But, we’ve definitely found that it’s important to take time out, shut it off and have personal husband and wife time together. So when we do that, we will make a conscious choice to not talk about the business side of our career. These are most likely the times when we walk our cats. HC: Since starting your music career together, has there been a time where you have been in a disagreement. If so, what was it over and how did you overcome it? H + M: Yes, especially in the beginning when we were finding our sound. We would disagree about vocal arrangements or keys of the song or production choices. Looking back, it was a really important part of our development as a group and that rub between us ended up being crucial to finding out who we really are as a group. We worked through it by hearing each other and experimenting and being open to each other’s ideas, and then luckily, when we hit on something we both felt passionately about, we knew that was “our sound”. Now we usually don’t even have to use words with each other, because we intrinsically know what is “us” and what isn’t. HC: What has been a highlight so far in your musical career? H + M: Performing our wedding song “Giving It All (To You)” on the Today Show was a huge highlight for us. When we wrote that song, we just wrote it for each other and never knew it would become a song that would be in the public eye in that way. Getting to meet Hoda and watch her sing along to the words was such a thrill! HC: What can fans expect from Haley & Michaels in the future? H + M: We have new music coming out! We will have a full length album that will be available this summer! We also just released a new song called “All Out” that’s on Spotify’s New Music Friday, New Boots and Wild Country playlists. In the coming weeks we will be releasing our official music video for “Me Too”! Thanks so much for having us!